(Phys.org) —Elon Musk over the weekend sent out a number of tweets about what's up at SpaceX in its rocket endeavors, talking about features that triggered a steady response stream of "Awesome," "Rad," and "Wow" reactions from Musk enthusiasts, eager to track the progress of the SpaceX reusable rocket program. Musk tweeted over the weekend: "Testing operation of hypersonic grid fins (x-wing config) going on next flight." "Grid fins are stowed on ascent and then deploy on reentry for 'x-wing' style control. Each fin moves independently for pitch/yaw/roll." Another tweet: "Autonomous spaceport drone ship. Thrusters repurposed from deep sea oil rigs hold position within 3m even in a storm." And still another: "Base is 300 ft by 100 ft, with wings that extend width to 170 ft. Will allow refuel & rocket flyback in future." In sum, Musk is showing off rockets with 'X-wings' and landing pads in the sea, said The Verge; Dante D'Orazio wrote about the Tweets on Sunday: The latest version of SpaceX's reusable Falcon 9 rocket has a set of four independently adjustable fins. "The grid fins are designed to deploy only after takeoff, when they'll work together with thrusters to help the rocket maneuver itself into position for those spectacular vertical landings." UPI noted the fins are referred to with 'x-wing config.' for the shape they make jetting out in four separate directions. Darrell Etherington of TechCrunch said the fins "could help spacecraft navigate upon re-entry after delivering personnel or cargo to an orbiting space station." The new modifications to the rocket should make atmospheric navigation easier, he added. As Musk also revealed, SpaceX is developing seafaring spaceport drones for landing, as TechCrunch put. These could be a safe and reliable targets for landing spaceships and, Etherington said, also mean that re-entering craft are away from any populated areas. This is an autonomous spaceport platform, using thrusters from oil rigs. The Verge said that the spaceports at sea are designed to give the reusable rockets a place both to land and refuel before taking back off for space. Hawthorne, California-based SpaceX has gained worldwide attention for a series of historic milestones. 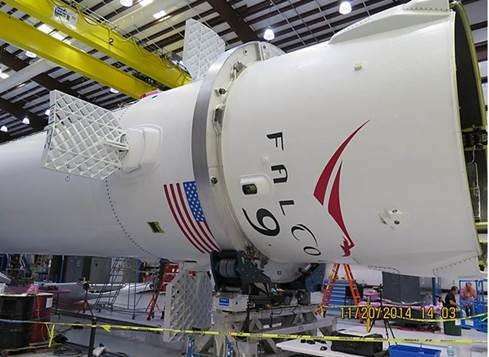 It is the only private company ever to return a spacecraft from low-Earth orbit, which it first accomplished in December 2010, said the SpaceX site. The company made more history in May 2012 when its Dragon spacecraft attached to the International Space Station, exchanged cargo payloads, and returned safely to Earth. Falcon 9 was made from the start to be reusable, designed for capable landing with the precision of a helicopter. It is intended for the reliable and safe transport of satellites and the Dragon spacecraft into orbit. Currently under development is the Falcon Heavy, according to the company, which will be the world's most powerful rocket. "All the while, SpaceX continues to work toward one of its key goals—developing reusable rockets, to transform space exploration." "Let's face it: Elon Musk is probably a time traveller," said Etherington, "sent back to help us leave earth behind and achieve the next phase of human evolution." Hundred's of satellites in ionosphere sending microwave energy back 24x7. That is one of the ideas that the genius described in the article has described as 'lunatic' or something such (losing money compared to his own preferred & manufactured solar panels). IIRC it was during the Q&A at MIT [video @ MIT]. I loved that quote, laughing hard!!! !